In 1974, Robert H. Dennard was working as an IBM researcher. He introduced the idea that MOSFETs would continue to work as voltage-controlled switches in conjunction with shrinking features, providing doping levels, the chip’s geometry, and voltages are scaled along with those size reductions. This became known as Dennard’s Law even though, just like Moore’s Law, it was anything but a law. There were two problems with his idea. The first is that it totally ignored leakage current. For the first couple of decades, this was not a serious problem because leakage continued to be small relative to switching power. Today, leakage can dominate total power unless significant power management is built into the device so logic not being used is powered down. The second problem was caused by attempting to control the first. In order to reduce the voltage, a thinner gate dielectric was required, but leakage required the opposite. Advances such as the introduction of high-k dielectric materials helped but nothing enabled the observation’s continuance. One important aspect of Dennard’s Law is that the power consumption of a transistor scaled down quadratically, which was necessary because device sizes also scaled by a similar amount. That meant that power density remained constant and thus heating was not a major issue. All of this started to become a problem in 2005 when threshold voltage started to flatten and power density began to increase. Now the industry has to worry about both leakage to control power, and activity to control thermal. Both of these are tightly coupled in a negative way such that an increase in heat causes an increase in leakage, which creates heat. Until now, this problem was solved by adding multiple cores so that tasks could be moved around to the cooler areas of a chip, but we may be nearing the point at which this will not work. The introduction of the finFET had a significant impact on leakage current, and thus a reduction in total power consumption, but does the finFET get the industry back on track with Dennard’s Law? If power density continues to rise, it means that when devices get smaller, the total power consumed per unit area will increase. At some point, no more activity will be possible. So far, Intel Corp. is the only company with a track record of two generations of finFET devices. With its first generation the company did show an increase in power density over planar, even though power per transistor went down. In late 2014, Intel announced its 14nm second-generation process. It managed to attain a 0.7 density shrink and also claimed an equal reduction in power. 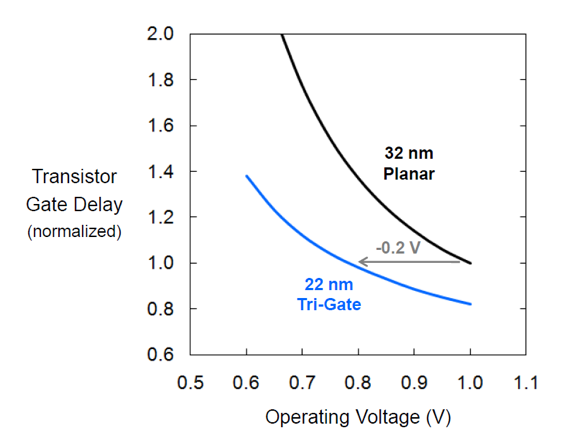 Much of the density and power reduction improvements came from a redesigned fin structure and a reduction in the number of fins per transistor. Intel also believes that the scaling will continue down to 10nm, but at this point there appears to be no mention of what power reductions can be expected per transistor. But we cannot directly measure thermal. “First you run the functional, and from that you can calculate power, and from power you can get to thermal and make the judgment if the temperature increase is tolerable,” explains Chang. Chang explains that when wires get thinner and narrower there is an increase in current density and that means a lot more stress compared to the previous generation of process. “Power, thermal and EM are all coupled and they all affect stress and reliability,” says Chang. It is too early to tell what will happen to power density with finFETs, but the initial data suggests that it will rise and begin to limit the total amount of activity that can happen on a chip. The only way this will change is if the thermal time constant for the chip itself can be changed, such as by adding materials that get the heat out faster. Thermal will become the new limiting factor and thermal analysis is still in its infancy. This means it is likely that early chips may face unexpected challenges, and some may not be able to operate at their specified rates. In short, we are no longer on the bleeding edge of design. We have moved to the burning edge. New approaches can lower power, but many are harder to design. Thermal issues become more complex in advanced packaging. Thermal effects are now a critical part of design, but how to deal with them isn’t always obvious or straightforward. The comment by Wingard seems odd, “the capacitance gets smaller because the distances between things got closer”. I thought that closer distances between conductors increased the value of capacitances. He means that because transistors are closer together, the wires between them are shorter and thus less capacitance. You are also right that the capacitance and coupling between the wires will get worse and that may reduce the benefit slightly, plus add additional thermal coupling issues.